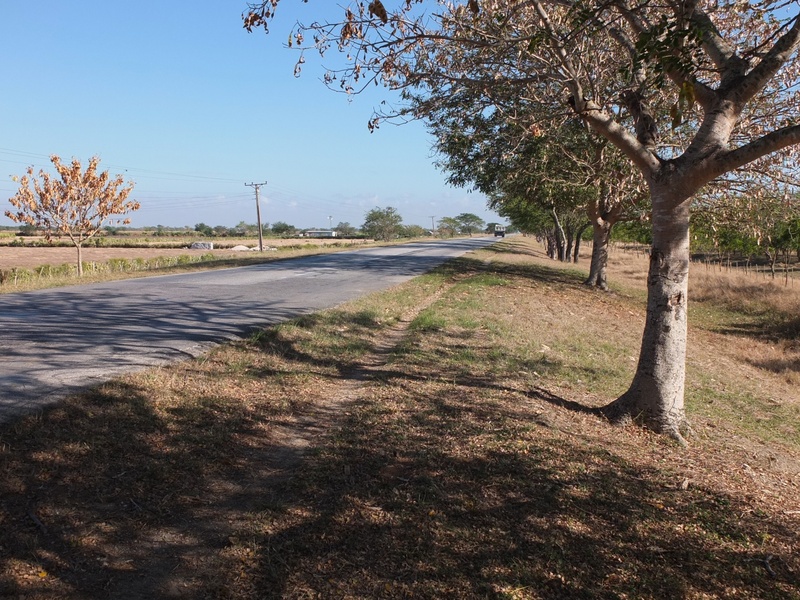 I was not sure what to expect of the 1100 kilometers of roads that made up my tour of eastern Cuba, the region referred to as Oriente by locals. The satellite map below shows my route. All that is missing are the bumps and cracks and potholes – and smooth parts too – that I would become very familiar with! (If you’re looking for a downloadable map set here is a link that will get you what you need. Update: It is now early 2017 and given all the smartphones out there – all with GPS built-in – I would guess that what I wrote about GPS devices is no longer true. If you’ve had a GPS-related experience recently, let me and other readers know what happened in the comment section below. Thanks! Quite simply, the roads were better than I had expected! 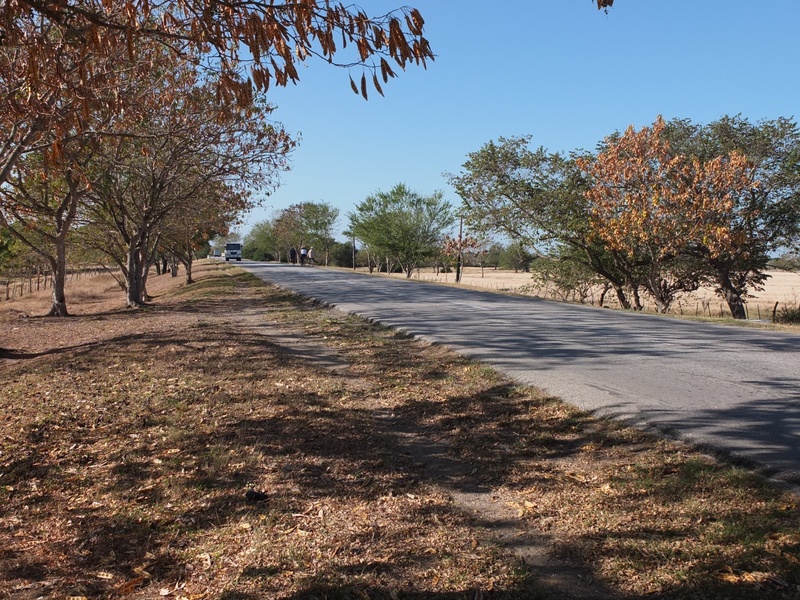 This isn’t to say that there aren’t any rough stretches but your legs keep those wheels turning and you do another 15 kilometers in an hour and the rough stretch is already forgotten and you are focussed on the next stretch. I picked the following pictures mostly because they illustrate something about the condition of the roads. 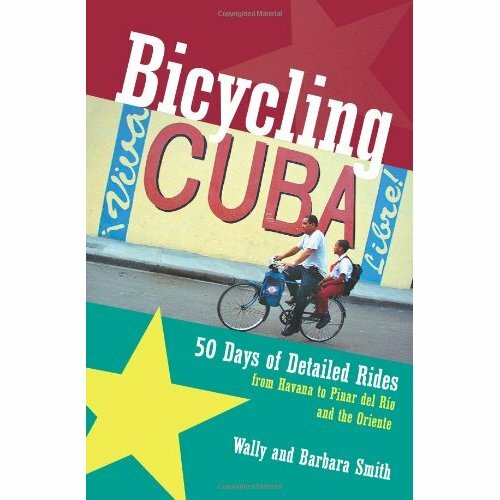 Invaluable for my trip was the guidebook Bicycling Cuba by Wally and Barbara Smith. One thing to point out – it was published in 2001! The fact that it is still useful tells you how little things have changed away from the resort areas! I just took along the final 50 pages of the book dealing with Oriente – it saved me carrying 270 extra grams for 17 days. However, given that a liter of water weighs over 2 pounds or 1000 grams, and I often carried two or three liters of water, maybe I should just have left the book intact! 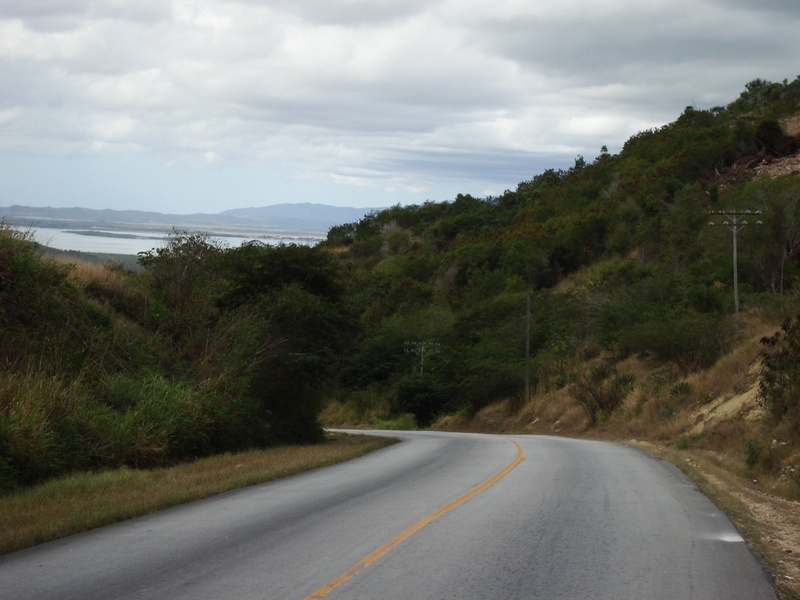 The roads from Holguin to Guardalavaca are an A – certainly as good as most anything I cycle in southern Ontario. Maybe the volume of bus traffic shuffling “snowbirds” (i.e. Canadian tourists) from the airport to the all-inclusive resorts along the Guardalavaca strip is the explanation for the top-grade quality. Click on all images to enlarge; click on all blue text to see the related web page. I saw very little traffic over 90% of the roads I travelled, the obvious exceptions being the leaving and entering of towns. Horse-drawn carriages were a common sight along certain stretches of the tour. I liked the extra Kevlar reinforcement that the Touring Plus had (at the cost of some extra weight) and the fact that the recommended air pressure was in the 70-80 psi range instead of 95-115. It was no problem keeping them properly inflated with my Topeak Road Morph pump. As it was, I did not get even one flat during the trip and I can’t really think of an occasion where I thought even wider tires would be better. Mind you, I have never had a mountain bike so having anything more than 32mm on the road would be a new experience for me. The only equipment failure was my handlebar bag; from the first day, the clamps holding the bag itself to the bar kept slipping downwards. I ended up putting the bag on top of my rear pannier rack, which meant stopping every time I needed something from the bag. 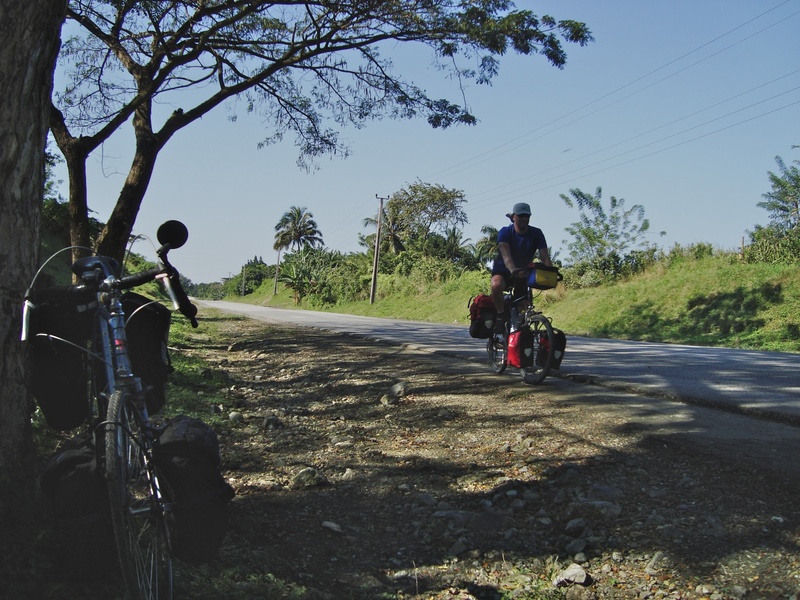 The good road continued from Guardalavaca inland to Banes, the major difference being the introduction of some hill climbing. 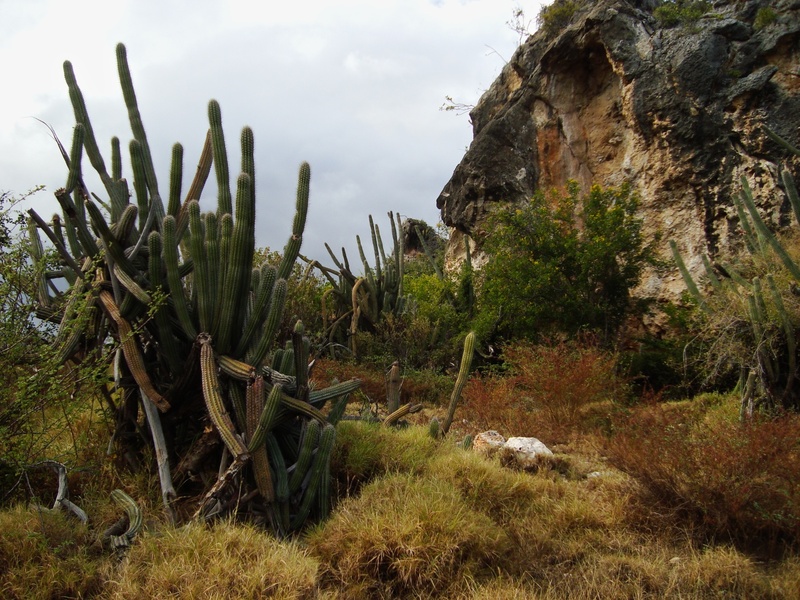 I stopped along the way to spend an hour visiting Cuba’s largest and most significant pre-Columbian archaeological site at Chorro de Maita. 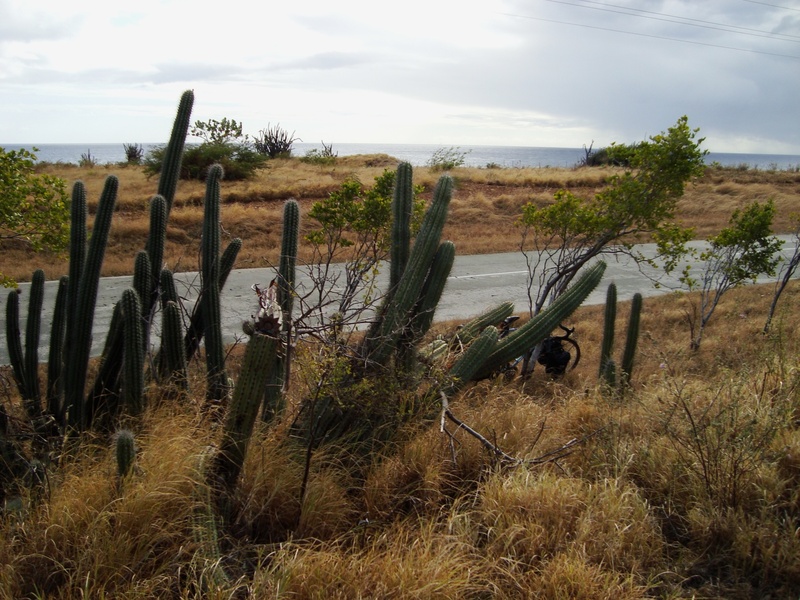 Perhaps the worst stretch of road I travelled was a short stretch of road going from the junction to Guardalavaca SE to Highway 123. Instead of taking the 307 I took the shorter but rougher 421. It had rained the night before so there were a few puddles! The stretch is only 12 km. or so and it was not a big deal. You can see the Google Maps view of what I’m talking about here. The day’s ride from Mayari to Moa (map here) was one of the longer ones, involving some climbing in lower gears. It was along this stretch that I caught up with Lars, a German cyclist with whom I’d team up for the next three days. Given the hills and the heat after about 10:30, we found shaded spots every 45 minutes or so and got out the water and an energy bar and took it easy. I had left Mayari around 7:00 and we got to the Hotel Miraflores in Moa at around 3:30. 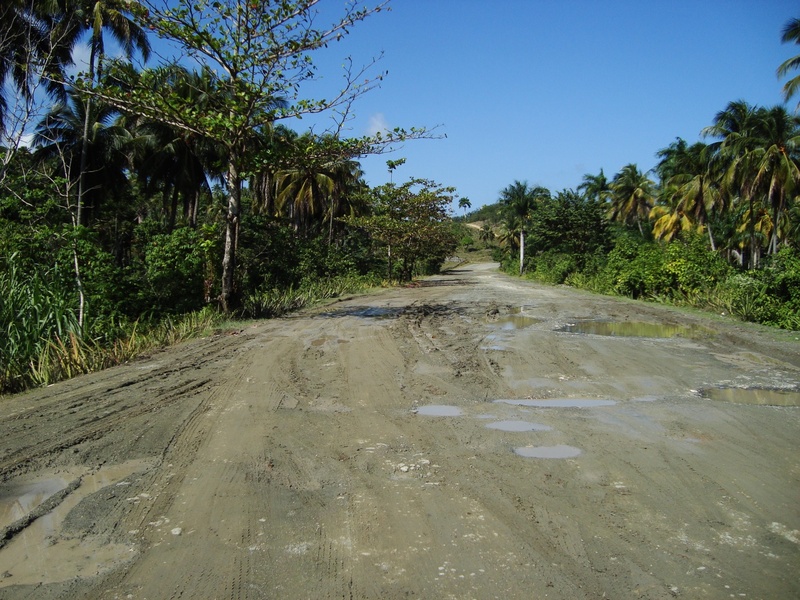 The road from Moa to Baracoa (map here) is quite hilly and badly eroded in parts. 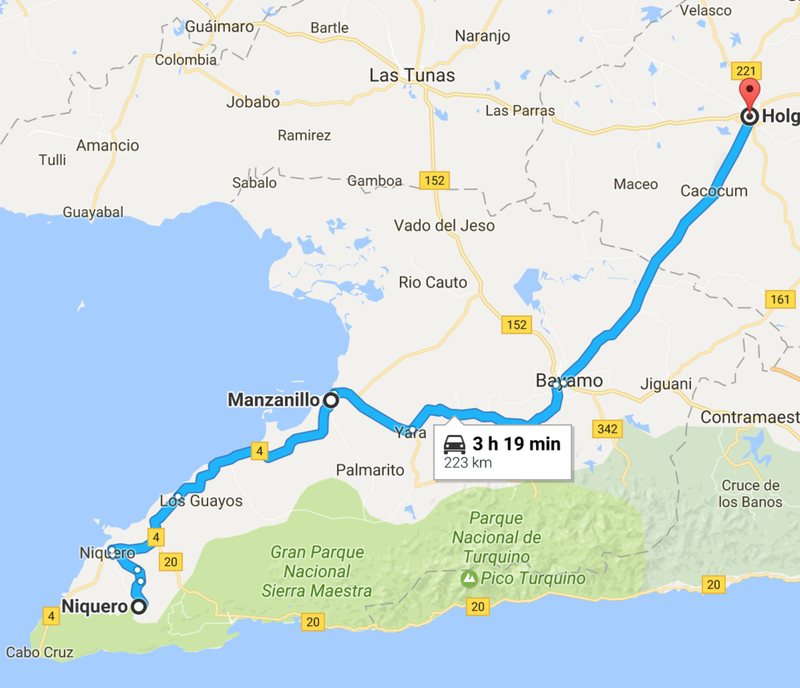 Luckily it is not a really long stretch – only about 80 kilometers and my itinerary broke it up into two days, with a stop at the Villa Maguana, near the playa with the same name so it wasn’t too bad. On the plus side, it was quite scenic and the rivers that come tumbling down from the mountains to the ocean provided a nice pit stop from the heat of the road. mi amigo alemán cooling his engine! Occasionally you come across sections of road with multiple layers of pavement just begging for a proper archeological examination of the various strata – stuff from the 1960’s underneath stuff from the early 1980’s underneath newer pavement from the late 1990’s, and each layer’s content just a bit different from the other. The trick is to weave your way through it all with the least number of bumps to the rim. 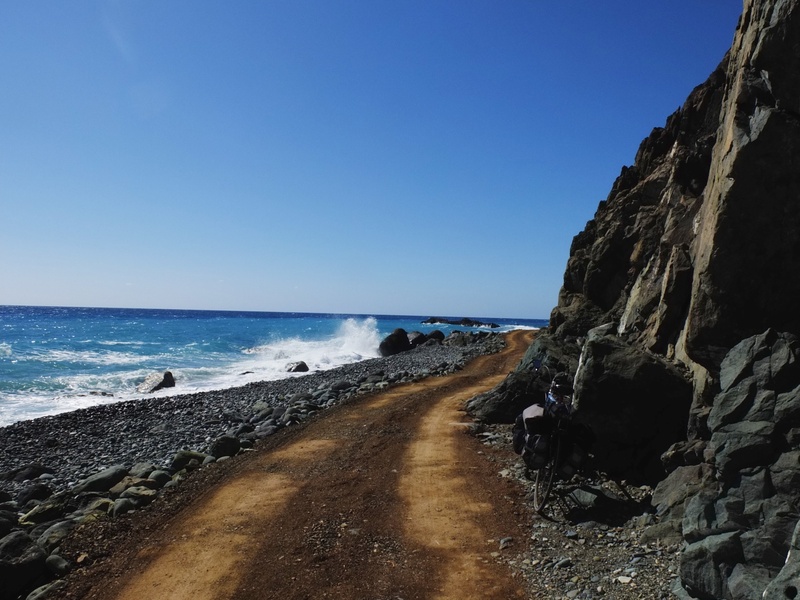 And always – especially on downhills – I was on the lookout for the expected rogue pothole, ready to swallow up my bicycle, or at least make my front rim completely warped and unusable. 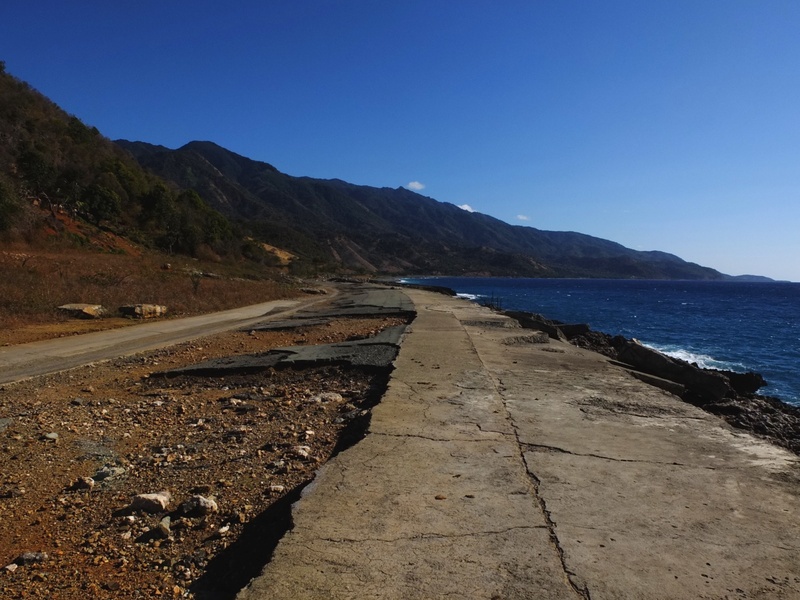 Once you get near to Baracoa the road quality goes up and stops being an issue all the way to Santiago de Cuba. 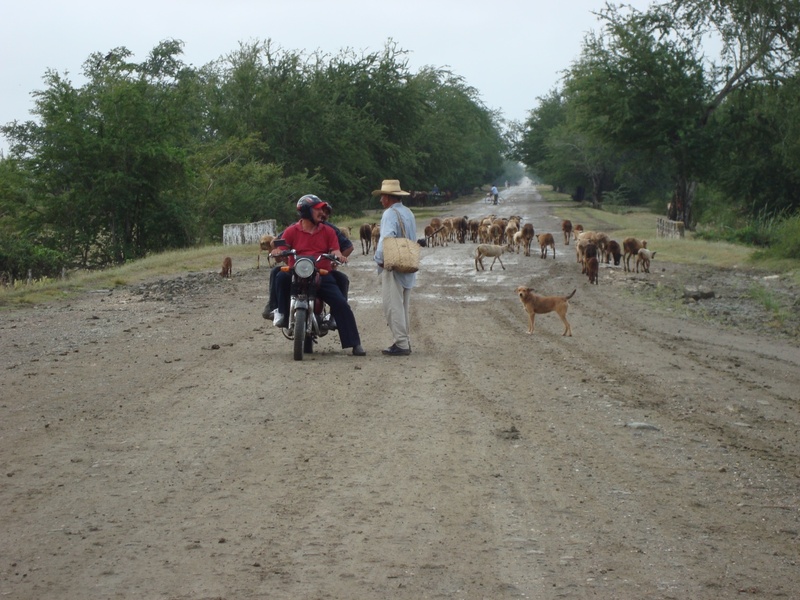 However, you do have the Carretera de la Farola to contend with! 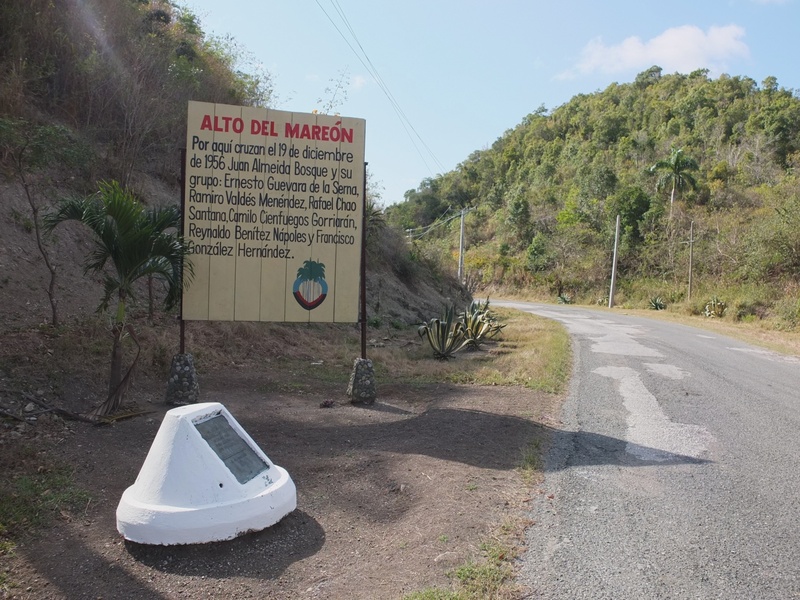 It is the dramatic high mountain road which connects the steamy jungle ecosystem of the Baracoa side with the desert-like south coast. There is definitely a bit of climbing to be done – and just as definitely, one hell of an incredible blast down the other side once you’ve paid your dues. I went over on a Monday morning – starting later than I had wanted to start because I had to stay in town for the opening of the Cadeca (money exchange bureau) at 8:30. 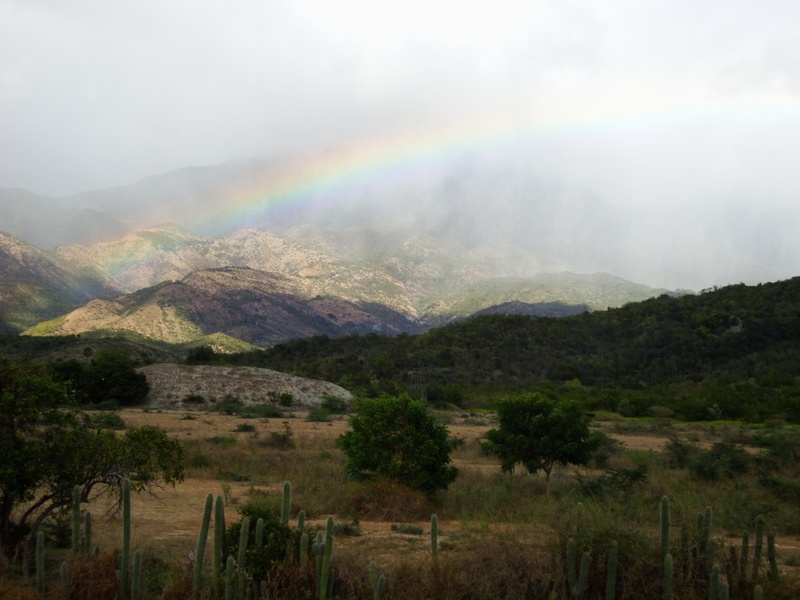 Also, it would rain most of the morning as I did the difficult part – cycling up to the top. el ciclista extranjero- y un poco loco? El ciclista extranjero? Or is that el yuma loco? (/Yuma is the Cuban version of gringo and loco is crazy!) Loco is the word that a local used to describe me as I got to the top of La Farola. For most Cubans the idea of spending your holidays cycling their island in the heat when you could be sitting under an umbrella on a beach sipping a mojito is – well, loco! From the Hotel Guantanamo to downtown Santiago was almost 100 km but the road was fine all the way and traffic was quite light except for leaving Guantanamo at 7:30 a.m. 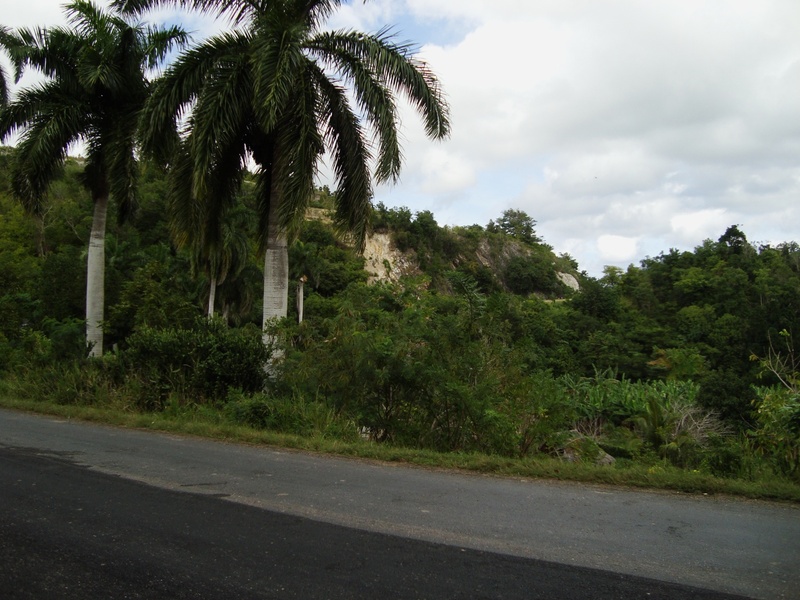 I was heading towards Cuba’s “second city” and my casa near Parque Cespedes. My two favourite days of cycling were those spent going from Santiago to Marea del Portillo. 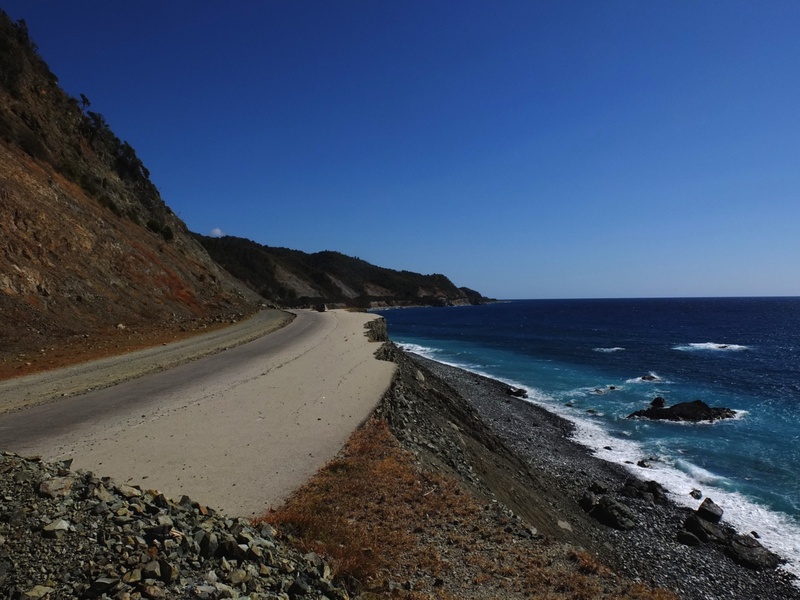 The scenery along the southern coast looked like this – the Caribbean Sea and gravelly beaches to my left, a sometimes battered road below me, and the Sierra Maestra to my right, and above an unrelenting sun shining in a blue sky that contrasted with the different shades of blue of the Caribbean. And the road? 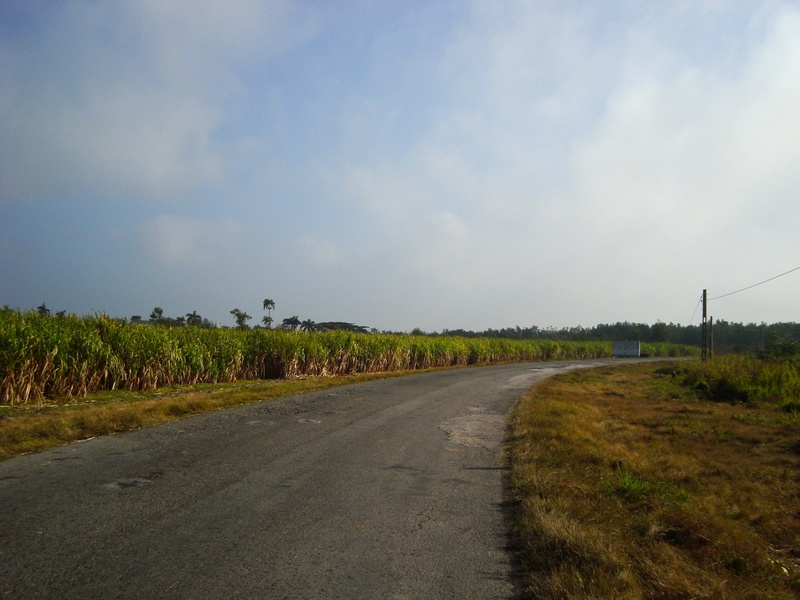 Yes, time and nature have not been kind to man’s efforts to impose a ribbon of pavement along the southern coast of Cuba. Had I been travelling in a van or a tourist bus on the way to my all-inclusive resort, I’m sure I would be talking about the road to Hell. On a bicycle, it really isn’t that bad. While there are some rough stretches – and those are the places where tourists will stop to take their pictures (as you will see in a moment! )- the road is not the biggest challenge here. If anything, I found the lack of shade and the feeling of being sandwiched between the heat of the sun above and of the pavement below that had been absorbing the sun’s energy all morning to be more of a concern. This is where I finally packed away my cycling helmet and put on my wide-brimmed cotton Tilley hat – it really helped to cool me down. I took the above shot from my room above the bay at the Brisas Los Galeones. To see the road on the way to Chivirico more clearly click the Google map here. Going west from Chivirico you come to collapsed bridges and places where the waves have eaten away at the road’s foundation – it is all very dramatic but in truth only makes up 10% of the distance travelled. Here is the best of the worst! 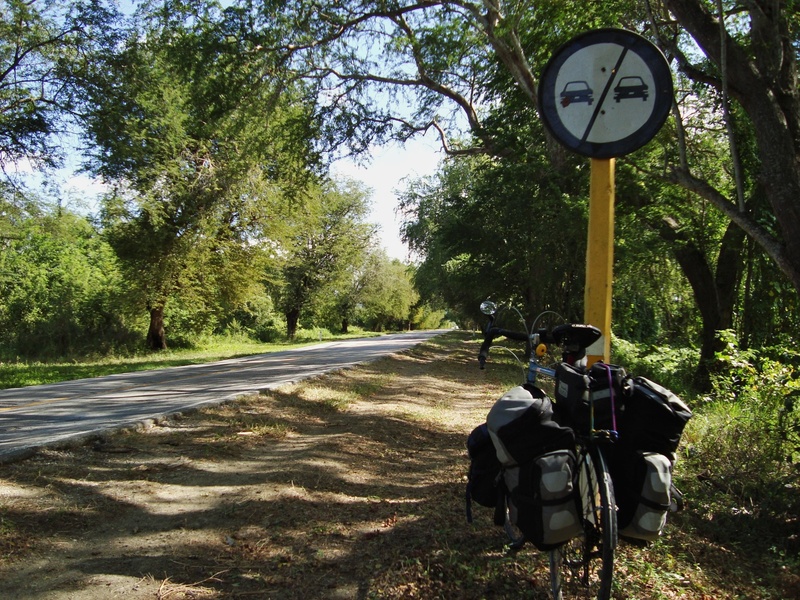 closed to motorized vehicles – but no problem for a bicycle! Note the gravel road to the side which the jeeps, vans, and tourist buses take. Add some nifty potholes and you have one bumpy ride. And then it is time to leave the coast. 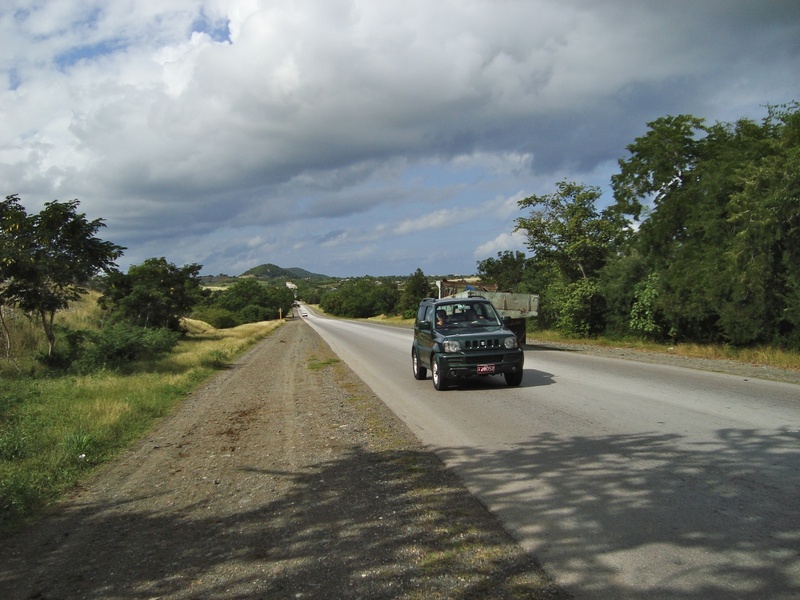 Just west of Pilon the road turned inland and took me over the Sierra Maestra. A couple of energy bars and a few water breaks later, I was near the high point with some exhilarating downhill as the reward. 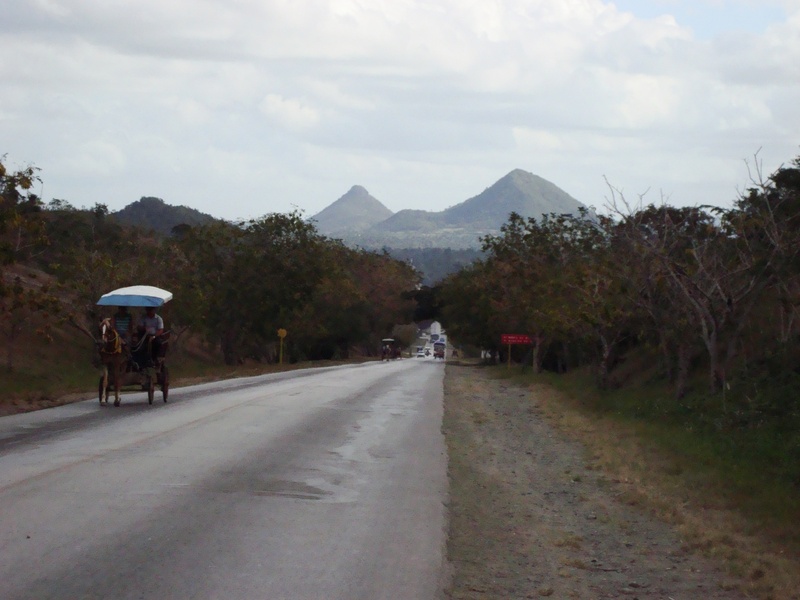 The riding for the rest of the trip, all the way back to Holguin, was easy on mostly flat terrain with the occasional hill. 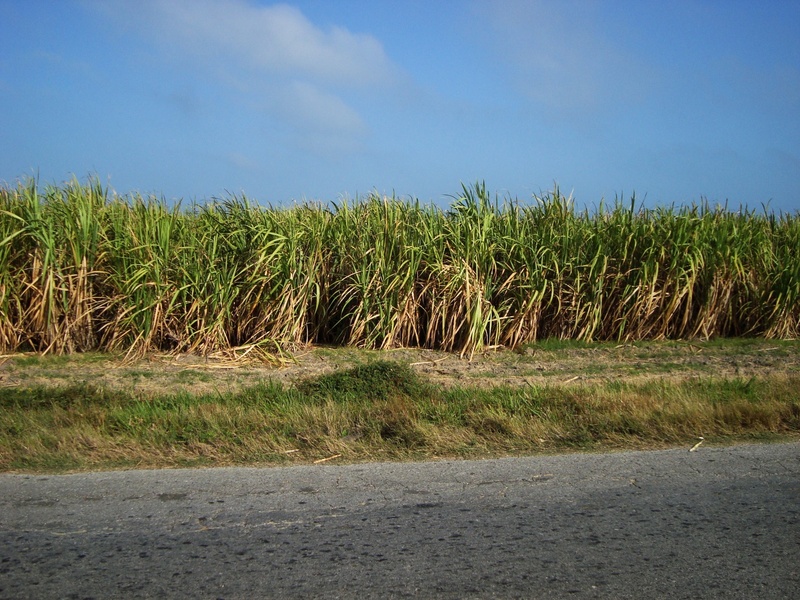 Shade was occasionally provided by the stalks of sugar cane that came close to the road. 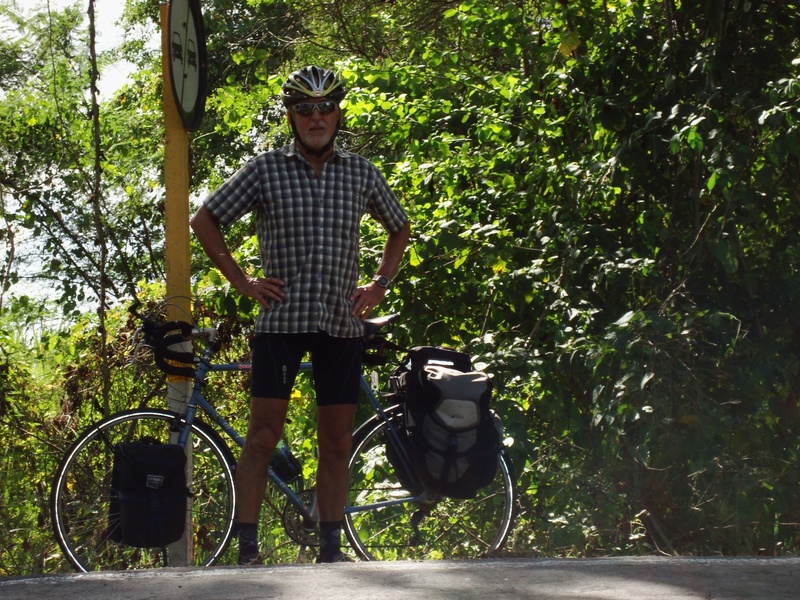 I spent a night in a casa particular in Manzanillo and two at the Hotel Royalton in Bayamo before finishing off the trip with the ride back to my bike box at the casa particular in Holguin before a cab ride back to the airport. See here for all the details on accommodation and food. 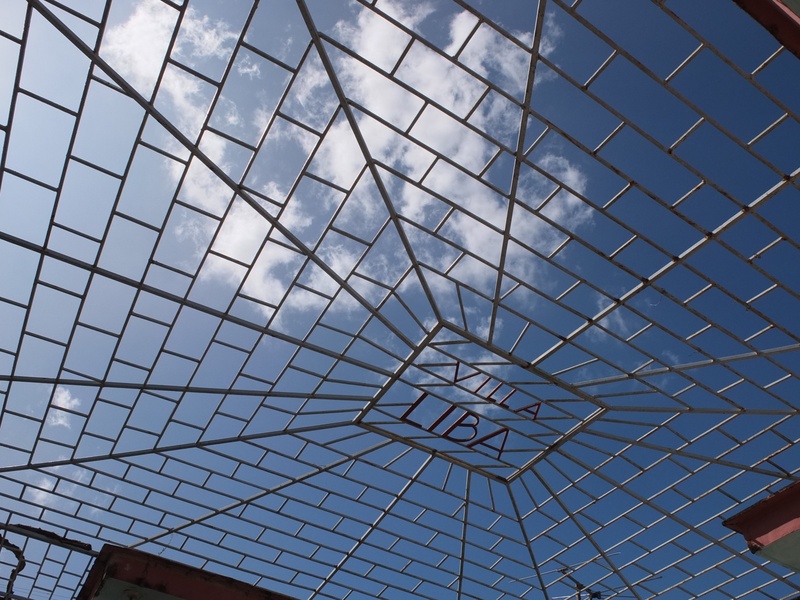 My trip ended where it began some seventeen days before – in the covered courtyard of my casa particular in Holguin, the Villa Liba. While I was taking off the pedals, the handlebar, and front wheel to put the bike back into the box, I looked up through the metal grill covering to see the same birds – the auspicious eagles or the “bad news” vultures!- that I had seen at the Mirador Mayabe at the beginning of the trip. It seemed like a nice bookend to my Cuban adventure. As luck would have it, by the time my camera was ready to shoot, the swooping birds were out of view and did not appear again. A few hours later I got to take a last shot of a different kind of “bird’ as my Cuban adventure ended! 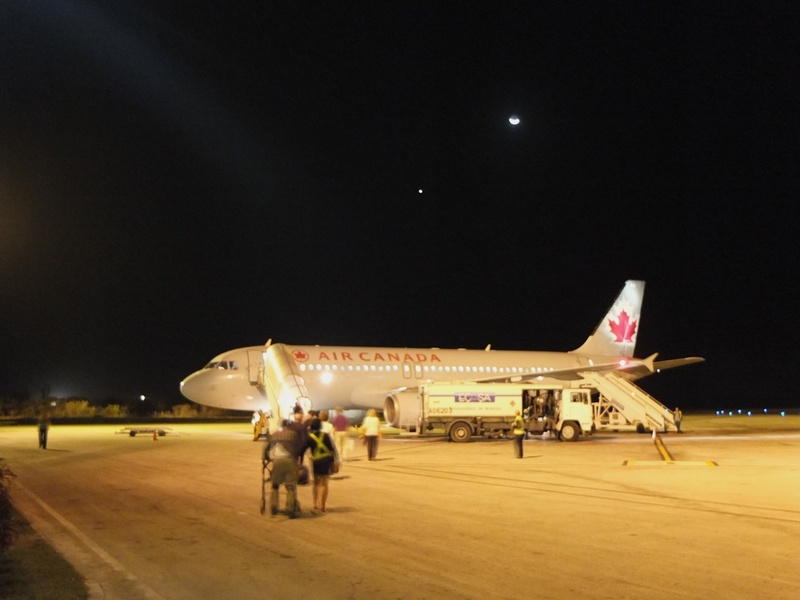 Frank Pais Airport west of Holguin – going back to YYZ! 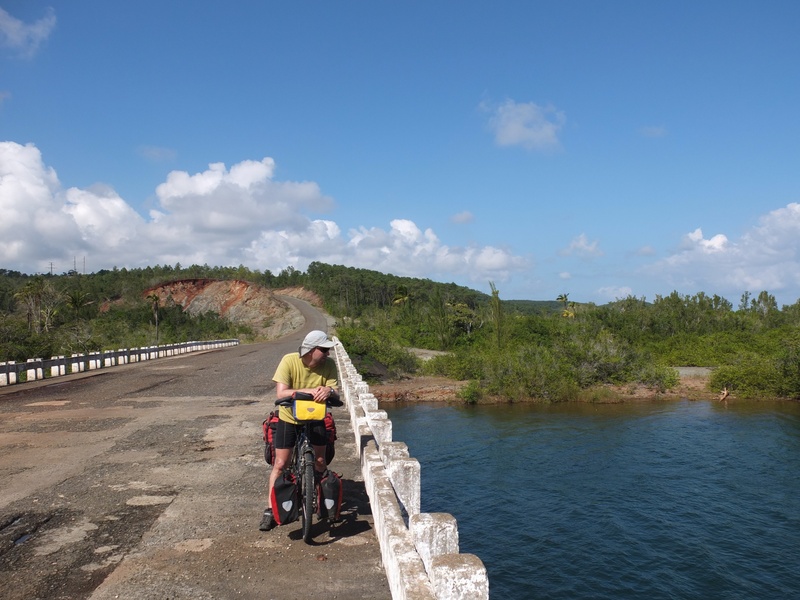 This entry was posted in bicycle touring and tagged bicycling along Cuba's south coast, bicycling Cuba, bicycling Oriente in Cuba, bike tour of Cuba, Cuba bicycle tour, Holguin bicycling, Moa to Baracoa by bicycle. Bookmark the permalink. Oh very good. Very good. 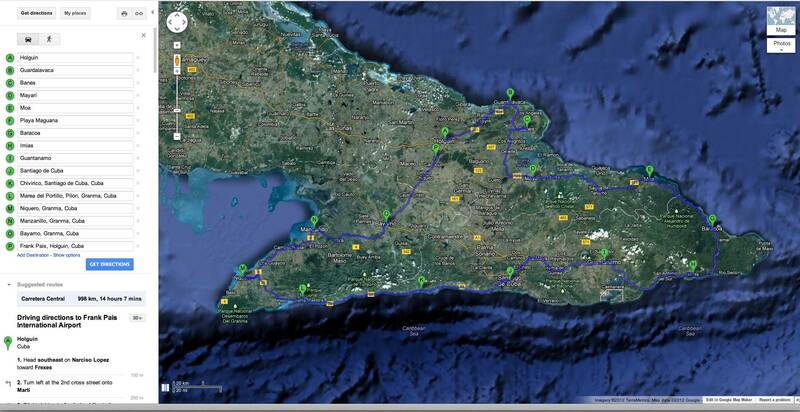 I just decided for my March 2013 vacation to bicycle Cuba, and found your web site for my preliminary research. I really enjoyed reading it as well as looking at the photos. Very informative. Will be back to check out more for the details. Gracias! I am heading out to ride the oriente next week and your write up is quite helpful. 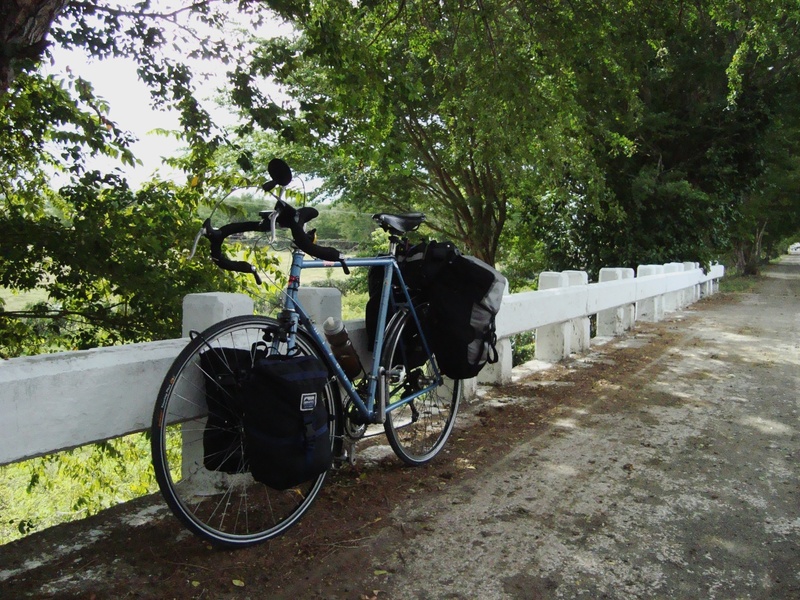 I really enjoyed reading about your adventures… wonderful detail and very inspiring and informative to anyone wishing to go cycling in Cuba. Thank you. 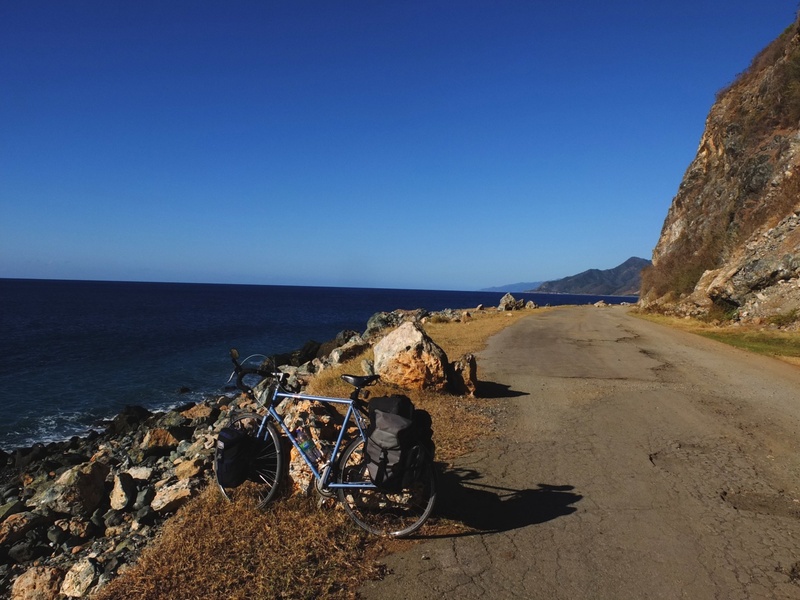 My dream is to cycle from Santiago de Cuba to Baracoa but I am wondering if I should begin my trip In Baracoa rather than in Santiago. I am wondering which way is easier. I am 68 years old and travel 35 kms per day comfortably. I could do 50 kms. I would need to make more stops than you did. Is this possible to find accommodation at regular intervals. What would be the longest distance I would have to travel in one day to get food and accommodation. What where your days like on this part of your journey. How many kms. did you do per day and how long did you cycle each day? Do you know the elevation levels. I cycled across B.C except for a couple of mountain passes . I am wondering how the elevations may compare. Are there more detailed maps of the area I could get? Or are there very few places en route that provide accommodation. 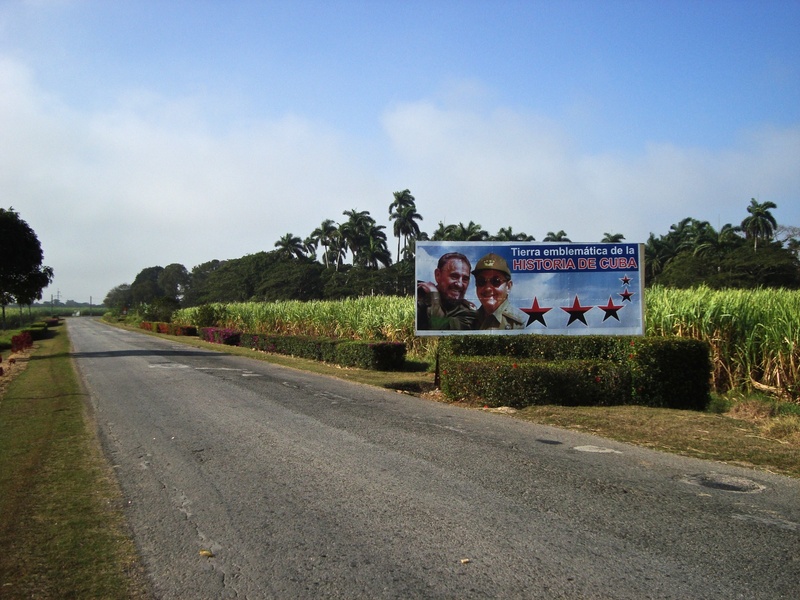 What is the distance from Santiago de Cuba to Baracoa? Is there back up support if I get in trouble such as a bus or taxi or donkey carts. I understand I could not use a cell phone to phone for a taxi. Any info or suggestions you may have on this section of Cuba I would appreciate so much. Ruth, my response is not going to be all that positive. 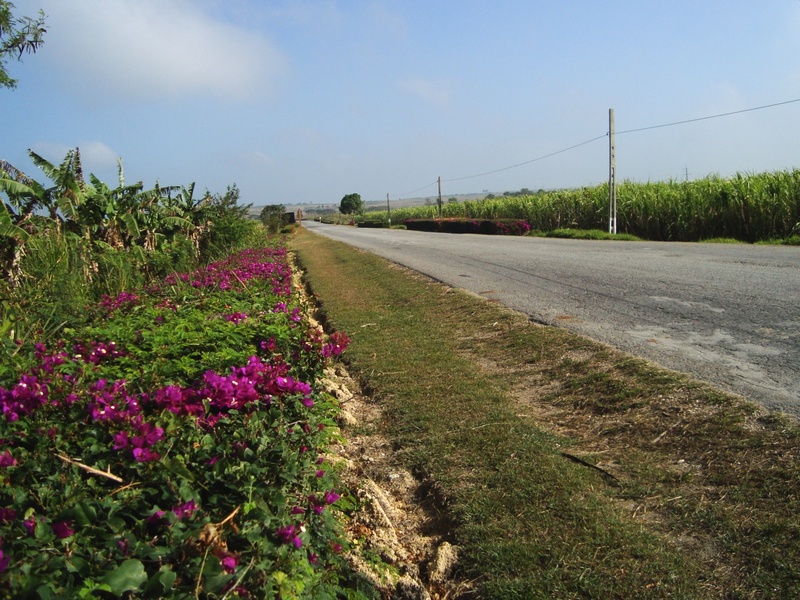 This stretch of Cuba is complicated thanks to the accommodation issue. Other than the beach resorts, Cuba really does not have a tourism infrastructure away from the beaches. The locals think we are loco to be bicycling around in the heat for fun – and, who knows, maybe they’re right! You also have a major hill to climb in the Farola. It is a dramatic ride but it is taxing. I got to do it in the rain. 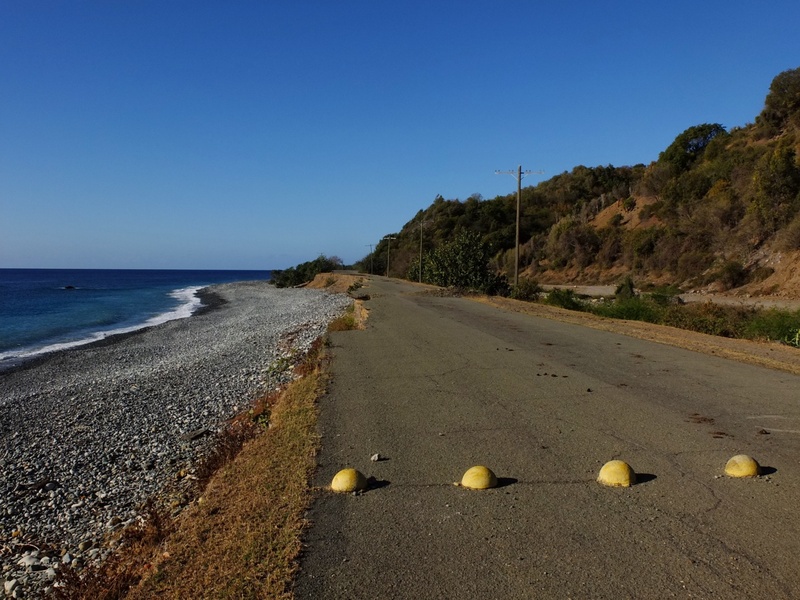 This is one of the more isolated stretches of Cuba! It really does not have a lot of tourist accommodation. People who have done it argue correctly that it is better to do it from Baracoa to Santiago instead of the other way around because of the hills, especially La Farola which takes you over a mini-mountain range. 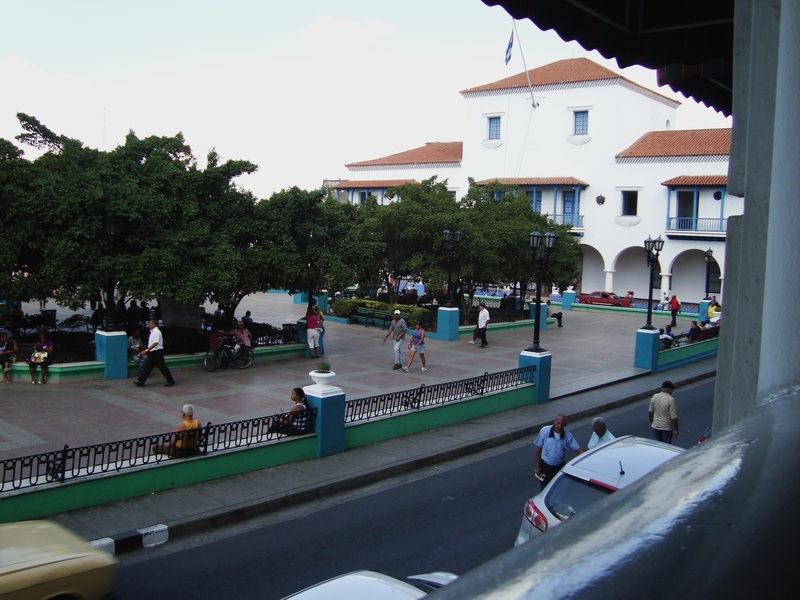 Baracoa is a totally delightful place to spend a day or three! (Lots of places to stay!) Once you leave Baracoa there is really no (official) accommodation until you reach the Campismo Rio Jacobo as I did on my tour. I guess you could tent somewhere along the way but it is frowned upon by the local officials. That is not to say that cyclists have not done it – you’ll find posts on-line by other people who have done it. 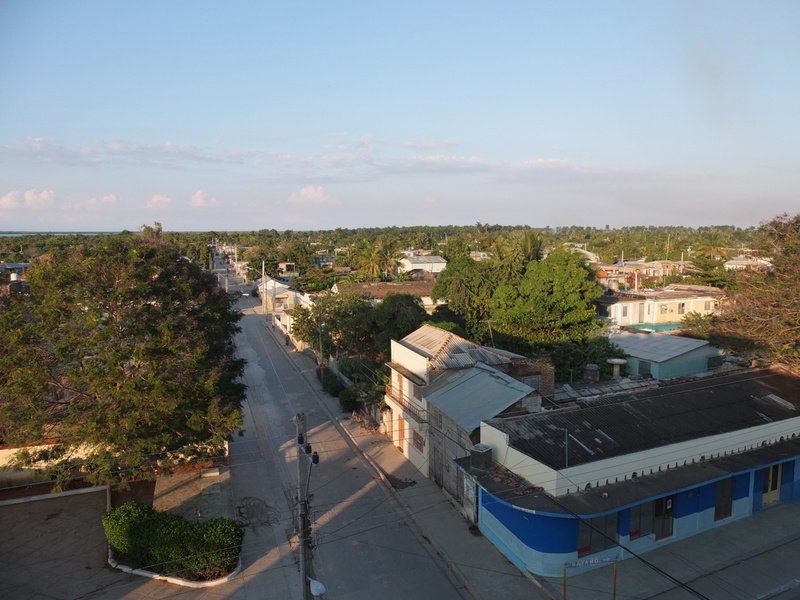 Sometimes as you cycle through a small hamlet locals will offer you a room in their home – an illegal but lucrative way for them to score some tourist pesos. I did not go that route either! 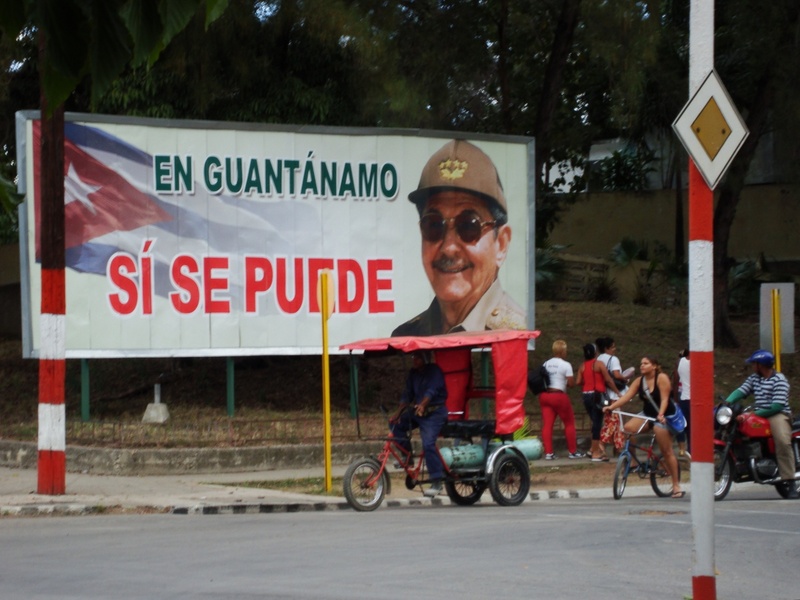 From the Campismo Rio Jacobo to Guantanamo City is another long stretch with no accommodation for tourists. So too the stretch from there to Santiago, which is a fantastic place to visit by the way! 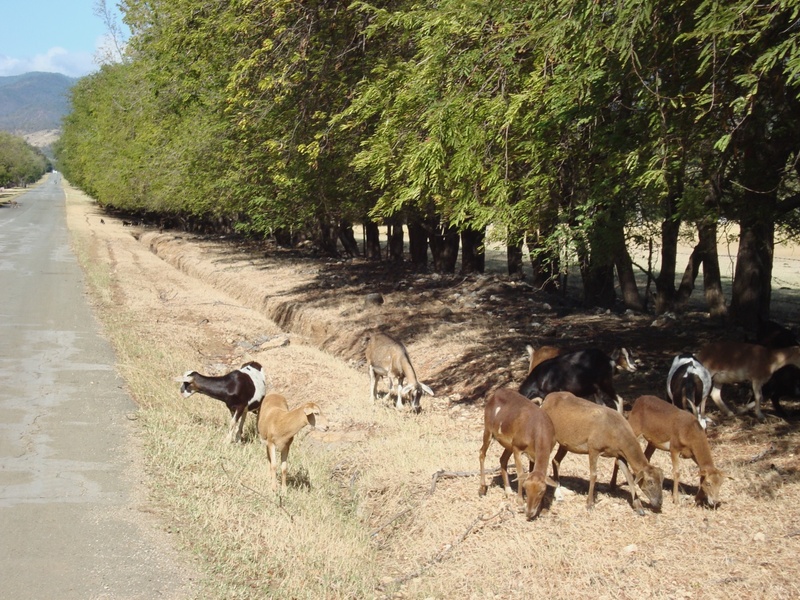 Of all the places I passed through in southern Cuba it was the one which had the most life and energy. Between the sun and the heat-soaked pavement I was frying like an egg! 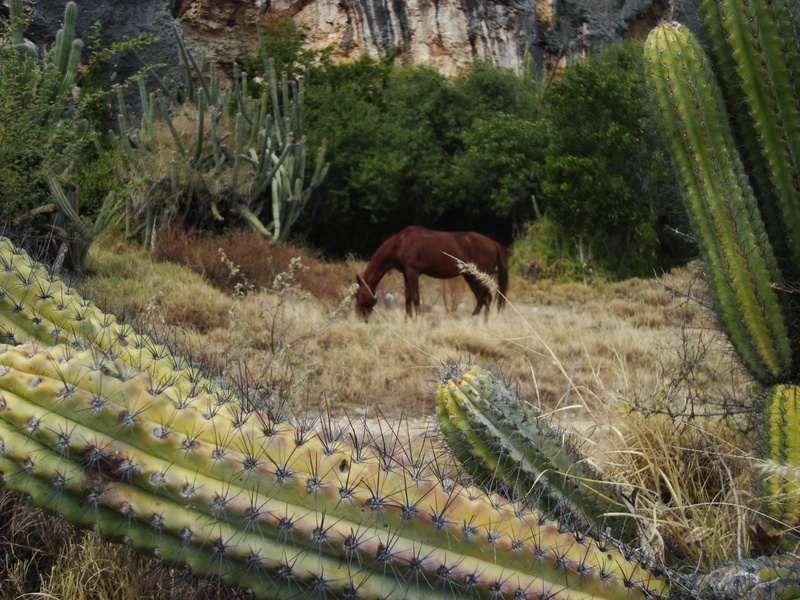 There may be other parts of Cuba that would lend themselves to something more like what you want to do – i.e. about 35 to 40 km a day of not too hilly terrain. 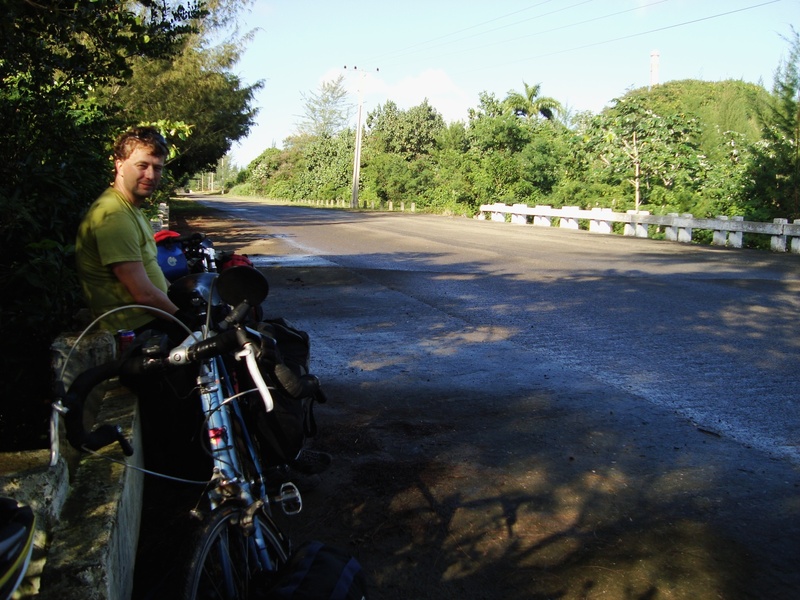 Why not look at the roads west of Havana – they seem to be a favourite of bike tour companies. Have you managed to dig up a copy by the Smiths on cycling In Cuba. 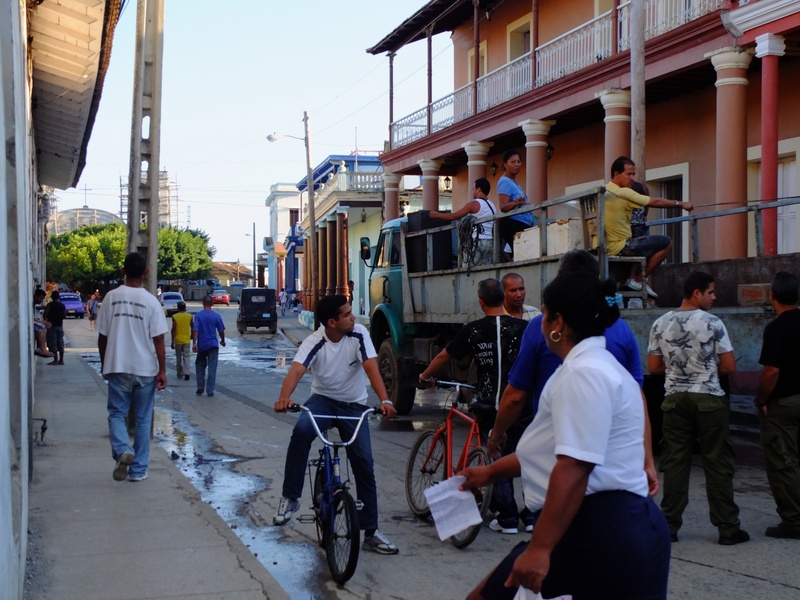 Even though it is now 12 years old things the basic infrastructure of Cuba has not changed all that much. Re: maps. The Smith book has all the maps you would need. Also, check out Google Maps or even better install the Google Earth application and take a look at Cuba with that. You can zoom in and get a fair amount of detail. This time of the year is a good time to do the trip. While it is no less hot that it is in July or August, it is way less humid – and that is a definite plus. Buena suerte with your plans. Send me another email if there is something else you are wondering about.